Norman Norell’s plaque on the Fashion Walk of Fame (and my shadow). For this month’s Fashion Walk of Fame post, highlighting one of the designers honored with a plaque in New York City’s Garment District on Seventh Avenue, I selected Norman Norell. I read about him every once in awhile in sewing magazines like Vogue Patterns or Threads, where his fine tailoring and couture-like techniques for ready-to-wear are held up for study for home sewers. Norman Norell (1900-1972) was born Norman David Levinson in Noblesville, Indiana. He studied fashion design at the Pratt Institute in New York City and in 1922 joined the New York studio of Paramount Pictures, designing clothes for Gloria Swanson and other silent movie stars. He also costumed the Ziegfeld Follies and the Cotton Club. He formed Traina-Norell with Anthony Traina in 1941 and founded Norman Norell Ltd. in 1960. He helped pave the way for Bill Blass, James Galanos and Halston (all honorees on the Fashion Walk of Fame). 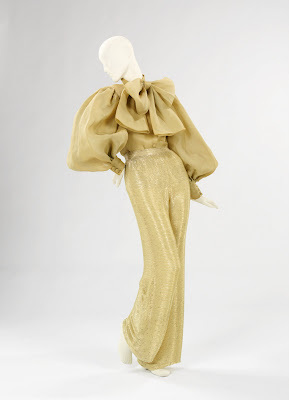 Evening Ensemble, 1970-1971. Gold organdy; beaded gold silk jersey. I mean, hello, I want to wear this for Christmas. I am in love with the giant bow and now I really need a pair of gold beaded pants. This Norell ensemble was part of the 24,000 items given by the Brooklyn Museum Costume Collection to The Metropolitan Museum of Art in 2009. 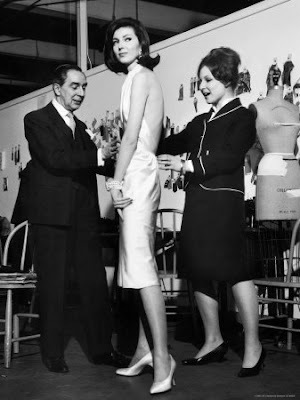 The title of this picture is “Fashion Designer Norman Norell Assisting Student Designer Deanna Cohen Fit Dress She Designed” and is by Joe Scherschel. It first appeared in LIFE magazine on June 6, 1960. I love the delighted smile on Deanna’s face. What a thrilling moment it must have been for her. You can buy this picture on Art.com. Dress, Evening. Traina-Norell, circa 1955, silk. 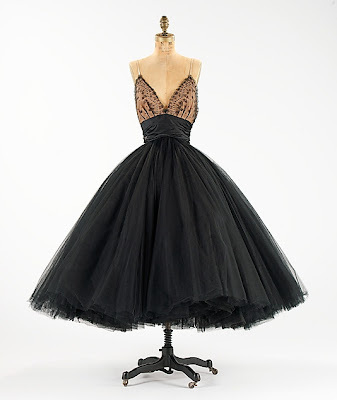 Photo from The Costume Institute archives at The Metropolitan Museum of Art. 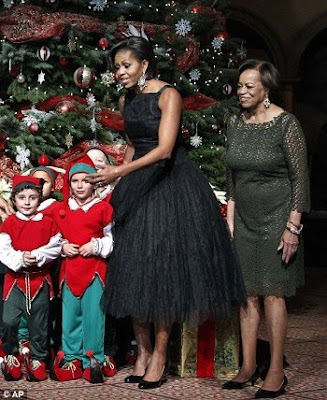 Michelle Obama in vintage Norman Norell for a Washington Christmas party in 2010. What a gorgeous dress and I love that her mother is right next to her. Photo by the Associated Press. 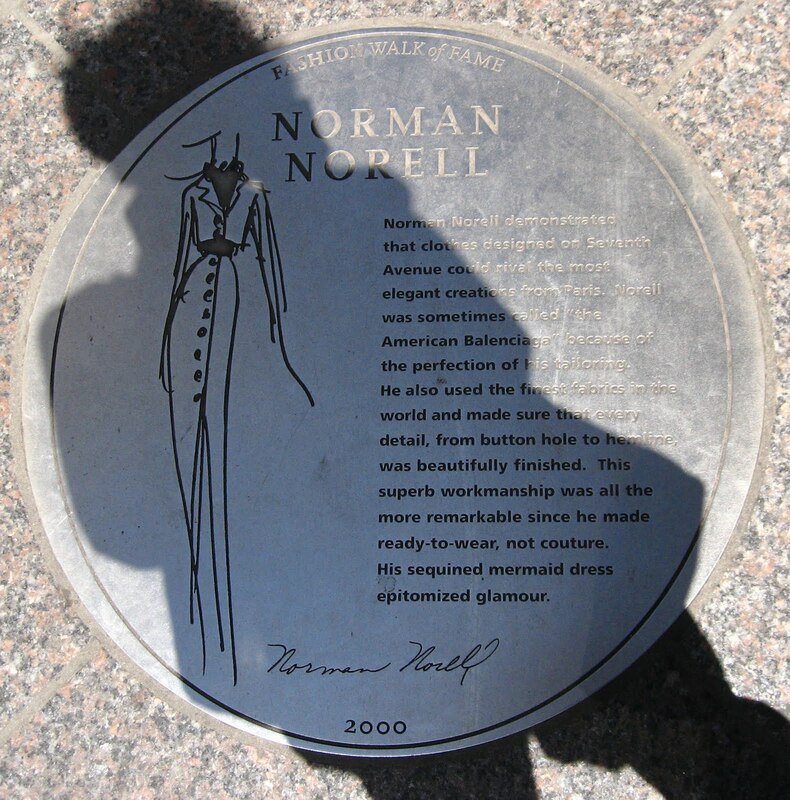 Norman Norell’s plaque is on Seventh Avenue between 38th and 39th Streets, next to Claire McCardell. How fabulous to get to know Norman Norell through you, my dear friend. I love the blouse, ahhhhhhhhhhhhhh, and of course the black dress. I learned something today...I was not familiar with Norman Norell. The outfit in the center that you want for Christmas has just captivated me...it is beyond fabulous! Thank you for the education! !